The designs of the BAGLINKS™ make them fully functional and adjustable to fit almost any bag. Take advantage of your bag’s existing hardware to put your in-round and practice needs at your fingertips. Many of the BAGLINKS™ snap directly to your bag’s rain hood snaps, which are vacant almost 100% of the time. Stop digging around in your bag’s 10 pouches to find things. BAGLINKS™ make for easy access to gloves, tees, marking pens, sunglasses, eyeglasses, towels, club brushes, range finders, accessory bags – no end to the possibilities. The concept of the BAGLINKS™ is to put your in-round and practice golfing needs within easy reach and speed up play. One of the most frustrating things during a golf round and a huge obstacle in growing the game is that of slow play. Take advantage of this totally functional and affordable golf bag appliance! Equipped with a 2-way snap, it will receive any other BAGLINKS™ product or it will receive your rain hood. This functional appliance includes 2 glove clips in combination with a 1-inch heavy duty plastic utility D-ring that also includes 2 pear clips for easy attachment of any accessories. 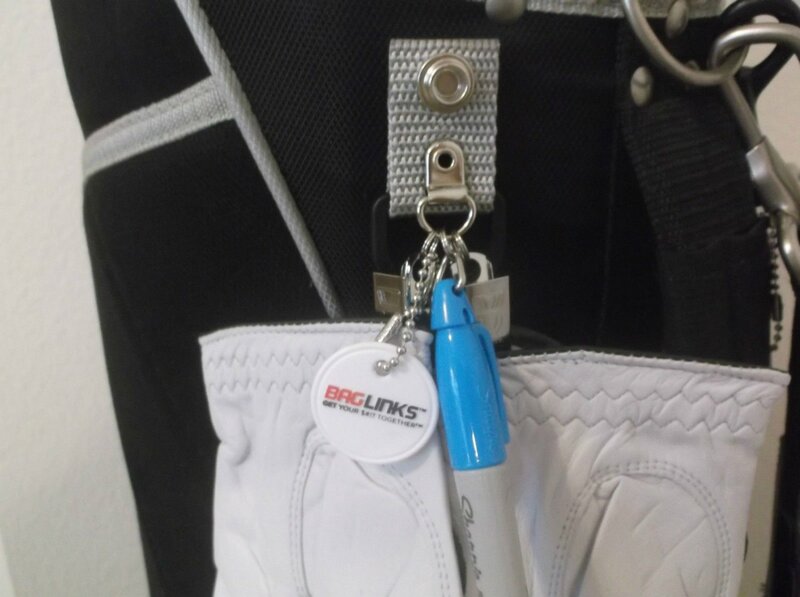 Along with a Mini Sharpie, it also includes a high-visibility BAGLINKS™ brand hangtag that can be easily removed via the ball chain and used as a ball marker, and quickly re-attached to the product for storage. This product will truly Get Your $#!? Together!™. Simply snap the Combo Caddy™ onto one of your bag’s factory-installed rain hood snaps. As with all of the other BAGLINKS™, you can also move it from bag to bag if you change bags. Very simple, sturdy, strong, portable, affordable. . but most of all, FUNCTIONAL! Features double strapping for a very “stout” product, hard action socket to ensure solid, firm attachment, and no stitching required! All web piercing burned through webbing (no cutting) thereby sealing around the holes. Made of 1-inch heavyweight polypropylene webbing. **Sharpie color may vary. *This product requires that your bag have at least one undamaged factory installed rain hood snap in order to attach it. **Please indicate your preferred..